Save Vs. Dragon: Thank you, thank you, thank you! I could never have asked for such an overwhelming reception to the d30 Sandbox Companion. I am truly blown away by everyone's response. If you'd asked me a week ago if I thought I'd be the #1 download at RPGNow for entire week, I'd have told you I would feel lucky just to break the top 20. And if you'd asked me if I thought I thought it would garner six 5-star ratings, I'd have told you, "I'm very proud of the way the book turned out, I (with Welbo's assistance) spent a lot of time making sure the book provided a lot of great DM tools (without fluff), and I hope that everybody gets some use out of it." I have no doubt that the sales over the last few days are due in no small part to Erik Tenkar's coverage on his blog. With nearly 8,500 people in his Google+ circles, and with his blog posts being reposted by a lot of different OSR RPG web content aggregators, his review on Friday (along with a giveaway of PDF copies), it really helped spread the word. BTW, congrats to Brutorz Bill, Fred Bednarski and DacholaEtecoon, who won the free copies via Erik's blog. 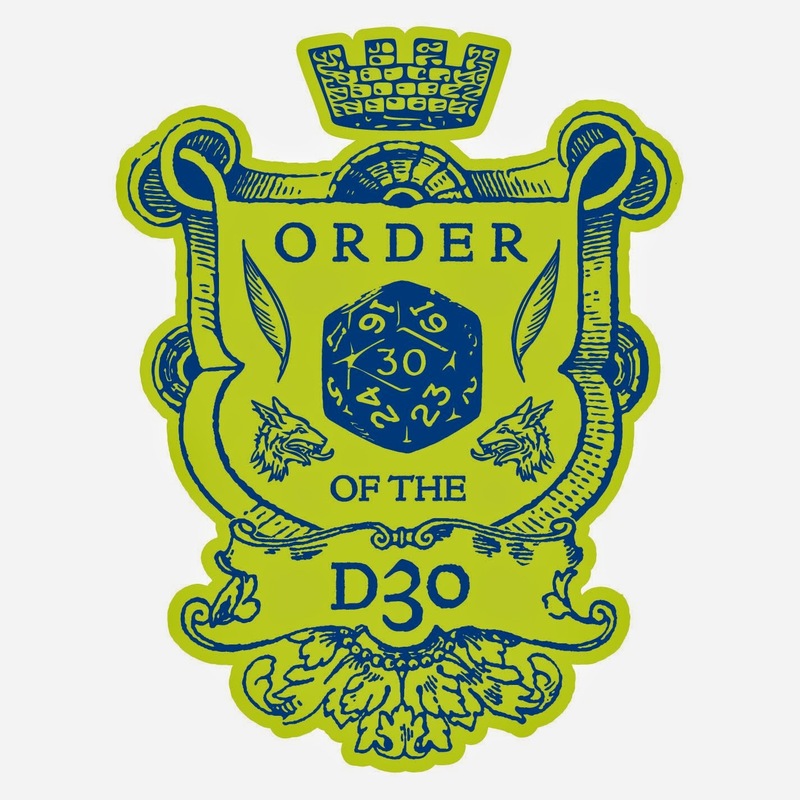 Also, a note to Moe and Robert (winners of my goods from Erik's 12 Days of OSR Christmas Giveaway), I have been delayed in getting print items out to you, so I've emailed you free PDFs of the d30 Sandbox Companion, and hope to get your various print items in the mail this afternoon. From the newest reviews at RPGNow. 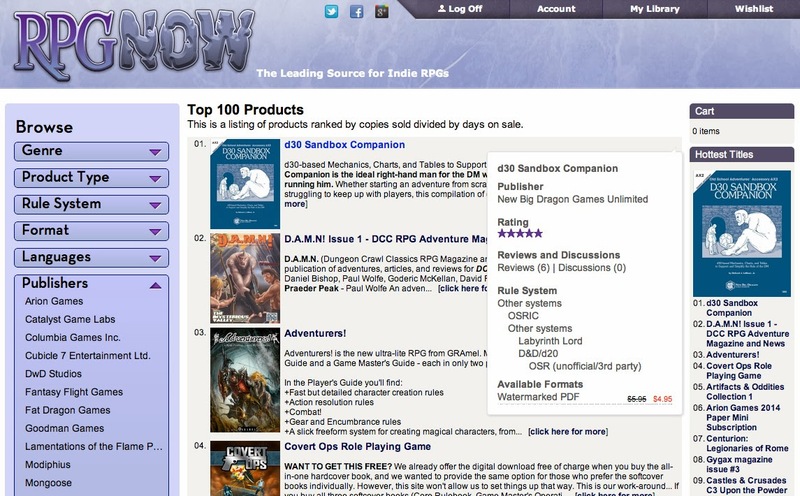 "Best $4.95 an Old School DM could spend in 2014 on gaming." "I'm a big fan of New Big Dragon products and this one is my favorite. I'm creating a campaign and the D30 Sandbox companion is now on top of a small pile of books I'm using to aid me in building a world. It's concise, so you won't get lost in hundreds of pages trying to find a chart you want to use. It's useful, there is something in here to develop various parts of your campaign. I highly recommend the D30 Sandbox Companion, especially if you are into building your own worlds." And print buyers, don't think I'm leaving you out. Not only have you put the d30 Sandbox Companion print edition at #2 in their Top 10 for the week in the gaming section, the d30 DM Companion print edition is #9. I don't think the d30 DM Companion cracked the top 10 when it was initially released! If you haven't seen an RPGNow email with the link to your PDF copy, check your spam folders. There's a handful of copies that have not been redeemed yet. If you still don't see an email from RPGNow, email me again and I'll see if I can resolve. 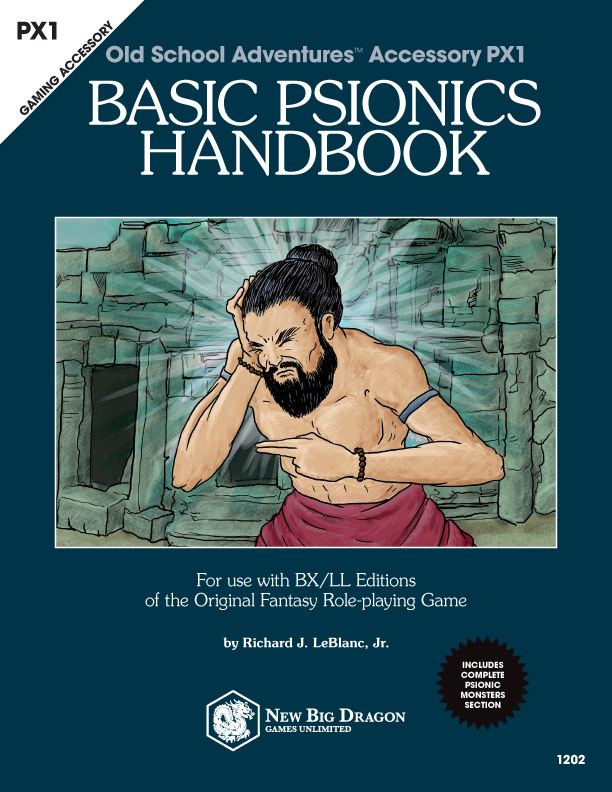 Get the d30 Sandbox Companion in print from Lulu.com at an introductory price of $9.86 (on sale from $10.95), and as a PDF from RPGNow.com at an introductory price of $4.95 (on sale from $5.95). These introductory prices will only be good until January 30, 2014. And don't forget, if you buy a print copy, send proof of your Lulu.com order to d30SBPrint@newbigdragon.com and I'll send you a free PDF copy (via RPGNow). If you've already purchased both PDF and print copies of the d30 Sandbox Companion, send me proof of your print purchase from Lulu.com and I'll send you a PDF (via RPGNow) of the d30 DM Companion or the Valley of the Five Fires (indicate in your email which one you'd like to receive). Congrats on the well deserved success. Yup, that was my review. Would you be willing to do an interview about the d30 Sandbox Companion? I downloaded it after reading the reviews, and if you'd be willing, I'd love to have you on a Firing Squad session! Absolutely! Just drop an email to d30SBPrint@newbigdragon.com with the details and we'll coordinate from there. Thank you for the give away. I did not see this post until now.